Here's the Carzone guide to buying a used BMW i3. You won’t see many zipping around (sales, as for most electric cars, have been pretty sluggish so far), but the BMW i3 represents quite a step-change in the electric car world. Not only was it the first all-electric BMW (something of an historic moment when you think about it) it was also the first electric car that you could describe as truly fun to drive. Even now, this side of a €100k+ Tesla Model S, it pretty much still is, combining BMW’s famed ability to give a car sharp steering and an enjoyable chassis balance with zero-guilt zero-emissions driving. With second hand prices for electric cars still quite soft, it could be just the time to pick yourself up a plugin bargain. BMW i3s are seriously expensive when new, starting at €36,000 even when you take the €5,000 VRT rebate and €5,000 SEAI grant into account, and it doesn’t take much to push them beyond the €50k mark with options. Used prices look like bargains, then, starting from as little as €20,000, and these cars have almost nothing that breaks, mechanically speaking. All models come with part leather seats, air conditioning, cruise control and the all-important satnav screen that includes, on later versions, maps that show how far you can get with the charge left in your batteries. How far will that be? The latest 94-amp battery models, introduced in 2017, can manage between 200- and 300km, depending on how you drive them. An older model will manage to just about hit the 200km mark on one charge, if you drive it very gently, but the secret is to go for the Range Extender model. This uses a tiny two-cylinder moped engine and an eight-litre tank of petrol as a generator, which keeps the batteries topped up when on the move. 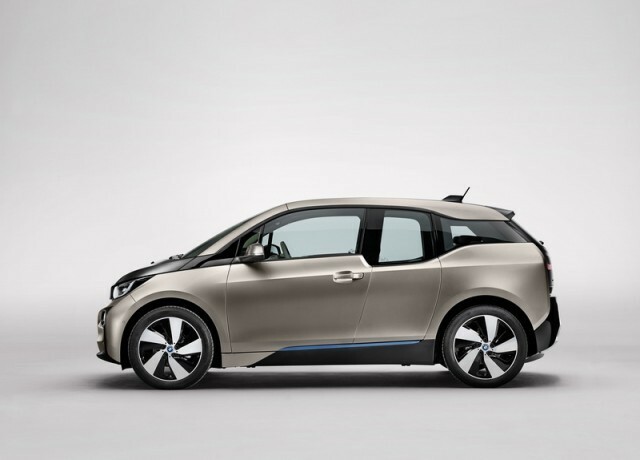 It’ll usually add as much as 100km to your charged-up range, and makes the i3 much more versatile. It’s a must-have, really. The only flaw with the Range Extender model is that, because it’s technically a hybrid (even though the engine never directly drives the wheels), it doesn’t qualify for the full VRT rebate, and instead gets €2,500 off. That makes it much more expensive when new, obviously, but that’s less of an issue second hand. Beyond that, key options to watch for are paint (many owners went for bright dual-colour schemes, but it’s worth seeking out a single-colour car as they generally look much better) and the light, matte-finish wood trim in the cabin. Full leather is also desirable. You will need to take time to wrap your head around the driving experience though. With 250Nm of instant torque, the i3 is very, very fast off the line, overall is about as quick as a MINI Cooper and you can drive it almost all the time with one pedal — lift off the accelerator and the regenerative braking is so strong it’s almost like the normal brakes on a conventional car. You only need the physical disk brakes for the last few metres, or for high-speed stops. Yes, it’s a lot of money (if you’re buying new) for a car with the cabin space of a MINI Clubman, but the i3 really is the wave of the future. It uses motorsports technology (much of the structure is made from race-car-style carbon-fibre) to achieve its efficiency, yet it’s as enjoyable to drive as any BMW should be. Snap one up cheap and you’re ahead of the motoring game.